Surge pricing is not price gouging: Why Uber and Sprig's policies aren't insidious. 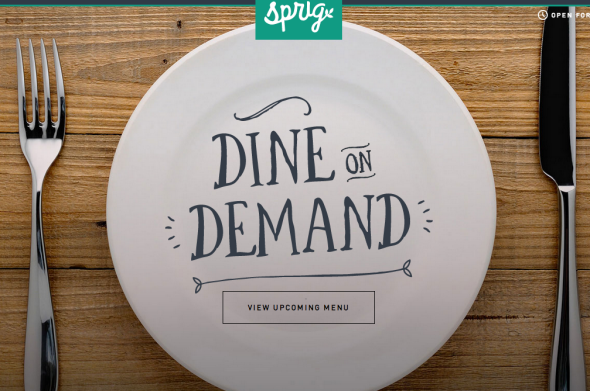 The food-delivery startup Sprig charges higher fees during its busiest hours. A San Francisco-based food-delivery startup called Sprig has begun charging “dynamic delivery fees” that rise and fall depending on the time of day and the distance of the delivery. So if you place an order from down the street on a Wednesday mid-afternoon, you’ll pay less for the delivery than if you ordered from across town at halftime of the Super Bowl. The concept is similar to that of Uber’s “surge pricing” system, by which the price of a ride spikes during rush hours and rainstorms. The scheme has proven controversial, with critics calling it a form of price gouging. Under fire from the public and the New York state attorney general, Uber agreed in July to cap those price spikes during emergencies. I often enjoy Valleywag, the Gawker Media-owned anti-tech blog that serves as a feisty gadfly nipping at the underbelly of the self-regarding Silicon Valley elite. And I don’t worship at the altar of the invisible hand. But to me, this post exemplifies the pitfalls of reflexively vilifying everything that Silicon Valley startups do. First of all, the idea of surge pricing is not to “randomly” jack up prices when demand runs “a little” high. It’s to systematically jack up prices by an amount commensurate with the spike in demand. And, in Sprig’s case, to systematically lower them when demand subsides, perhaps even to the point of free deliveries in certain circumstances. While “reaping profits” is certainly part of the goal, surge pricing can also benefit customers. The drivers for startups like Uber and Sprig are often independent contractors with flexible schedules. Surge pricing allows them to make more money at times of peak demand, giving them an added incentive to work during the hours when they’re needed most. Overall, that should mean that more people will get the rides (or deliveries) they want, at the time they want them. Could it also mean that customers on a budget will be left behind? It could. But that’s only “insidious” if the product or service you’re selling is one that people really need, like when someone’s house is on fire and you’ve got the only hose. Charging exorbitant rates under those circumstances is price gouging. If, on the other hand, what you’re purveying is a luxury good—like Tiffany bracelets, say, or a trendy Web-based service that delivers persimmon salads to your door—then by all means, charge what the market will bear. Pandering to an exclusive clientele may not win you any civic prizes, outside of the occasional TechCrunch Disrupt award, but it’s a feature of any market economy. Which brings me to the biggest thing that ValleyWag gets wrong here: the implication that demand-based pricing is a Silicon Valley invention. Airlines have had dynamic pricing schemes for years. Gas stations hike their prices in advance of holiday weekends, and hotels raise rates in the high season. And how about those insidious stock exchanges that allow brokers to randomly jack up prices when demand for Apple shares runs a little high? The difference, as Matt Yglesias has pointed out, is that companies like Uber and Sprig are being more transparent about their pricing schemes than the airline or hotel industries. That, if anything, is the Silicon Valley-specific trend that Valleywag and other critics are attacking. The effect of tech blogs vilifying surge pricing is to dissuade companies from being so transparent about it. I’m not here to defend Uber against all charges of shady dealings. CEO Travis Kalanick is a ruthless Randian with a penchant for fighting dirty. And to the extent that Uber is becoming an integral part of some cities’ transportation systems, there’s a legitimate concern that we risk replacing essential public infrastructure with a private service that prices out the poor. But that sort of thoughtful critique requires you to draw a distinction between monopolistic price gouging and everyday price signaling in a competitive market. There are plenty of insidious trends worth fighting in Silicon Valley: disregard for people’s privacy, the fetishization of disruption, win-at-all-costs growth hacking, the intractable homogeneity of the venture-capital industry, the chasing of pointless fads at the expense of genuine innovation. There’s no need to add surge pricing to its list of sins. Should D.C. Cabs Introduce Uber-Style Surge Pricing?